Luxury 2100 square foot ground floor unit on Medano beach. Enjoy views of water features and beautifully landscaped gardens on the patio. The patio features two lounge chairs, a gas grill, and an outdoor dining table, with sun in the mornings and shade in the heat of the afternoons/evenings. Villa La Estancia offers infinity pools with a swim up bar, 5 hot tubs overlooking Lands End, executive fitness center, and a concierge staff waiting to make your stay the vacation of a lifetime. Several restaurants are on site as well as room service 24 hours a day. The condo is spacious and elegant with marble floors throughout. The unit has a full kitchen, breakfast bar, dining room and living room with a fold out, queen size couch. The master bedroom has a king size bed, sitting area and a large master bath with separate shower and jacuzzi tub. The master bath also features a double vanity and two closets. The second bedroom has two queen beds and a nice bath with a shower/tub combination. The third bathroom is off the living room. Guests at Villa La Estancia have full privileges at Villa Del Palmar and Villa Del Arco. A new 60,000 square foot spa and a 4,500 square foot fitness center are also available. There are several more restaurants at Del Arco and Del Palmar. Located on the property is a nice market with a pharmacy and a deli that serves great sandwiches and salads. If you didn't bring your computer there's an internet cafe that can serve your business needs or checking emails and Facebook. Next to the market is an ice cream shop that sells yummy ice cream. Del Palmar has a wonderful Paradise Childrens program that my children enjoyed until they got too old! Enjoy lunch on a Pirate ship or themed dinners during your stay. A short 5 minute taxi ride will take you to town and the Marina with many restaurants and a great night life. Watch the boats come in while enjoying dinner or cocktails. A 10 minute stroll along the beach will take you to the Office. Stop by Tabascos on the way for two for ones all day! World famous golf and Sportfishing are right at your fingertips. We live in the mountains of Colorado and love to escape to the beach. 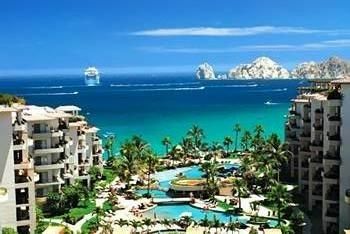 Cabo is a short 3 hour flight. Our unit easily fits our family of 7. My husband loves the peaceful pools at La Estancia, while my sons love the activities at Del Palmar. My daughters love the whale slide and the pirate pool. I love the beach and great restaurants. One of my favorite vacations was eating on the beach at La Estancia with my family on Christmas Eve. No snow, but what a wonderful experience. My parents also enjoyed one of their favorite anniversaries with a private dinner on the beach. The staff is wonderful and we feel very safe at La Estancia. Every time we walk into the wonderful smelling lobby we know we're home. The ground floor is wonderful for families with children. We aren't right beside the pools so its quiet too but easy to access. We love the pools and the beach. I like that we can eat breakfast and lunch in but have dinner out at one of the amazing restaurants. We've snorkeled Lovers Beach, sport fished, para sailed, rode wave runners, viewed fish in glass bottom boats, hung out at the Office and many more wonderful activities. Hair dryers included in each bathrooms as well as sample shampoo/conditioner. Full kitchen with ice maker, blender, toaster, coffee maker. Wonderful resort with fabulous service! Unit was clean and decorated beautifully. Loved being on the first floor with easy access in and out through the patio! Hosts had the unit stocked with all kitchen dish-ware & utensils... etc! Would definitely recommend staying here! It was the most relaxing vacation we have ever had. The staff was great, anything we wanted was brought to us right away.. This unit was AWESOME! Clean, updated, and cozy. Being on the first floor allows you to have quick and easy access to everything Estancia has to offer. Hot tubs are a few seconds walk away and the beach/multiple restaurants on site are within 1 minutes walk as well. Overall Estancia is exclusive, quiet, and incredibly clean and I would not hesitate to choose this unit again when heading back to Cabo. The staff really made us feel at home and we wish we had more than 1 week there. It was the perfect place for our family. Unit was beautifully decorated and very comfortable for our family of 5. Wonderful resort and accommodations! Great for families. This unit is very close to the front check in part of the resort and hot tubs. You are further back in the resort from the beach and pool area, which makes it a little quieter. Very close to front check in area which is nice if you need taxi or something from the mini mart.